Israel has increased pressure on the Palestinian Authority by threatening to sever all contact with it if the next prime minister is affiliated to Hamas. Defence Minister Shaul Mofaz said it would be inappropriate to deal with the PA after Hamas won a majority in last month's parliamentary elections. Hamas has rejected demands that it recognise Israel and renounce violence. Israel previously said it would work with Palestinian leader Mahmoud Abbas if he did not co-operate with Hamas. Acting Israeli Prime Minister Ehud Olmert said two weeks ago that he had "no interest in harming" Mr Abbas, and that Israel would continue transferring monthly tax payments to the Palestinian Authority as long as Hamas was not in control. Mr Abbas has said he will ask Hamas to form the next government, but called on it to respect the previous agreements such as the international peace plan known as the roadmap. Hamas leaders say they plan to appoint a cabinet in early March, and that the next prime minister will be a member of the group. Ismail Haniya, seen by many as Hamas' main candidate for the post, said the new cabinet would be in place a fortnight after the first session of the Palestinian Legislative Council (PLC) on Saturday. But Mr Mofaz said such appointments would lead to official ties being cut. "If the Palestinians choose a parliament speaker and prime minister who are affiliated with Hamas, Israel will immediately sever all contact with the Palestinian Authority," he told the Israeli newspaper, Yediot Aharonot. 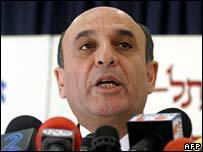 Mr Mofaz said the speaker of the PLC was President Abbas' deputy and is considered the "number two official in the PA". "If he is from Hamas, we will not hold any contact with them, and there will be no compromises," he added. Mr Mofaz also said he believed Hamas would not change its stance towards Israel if it led to a new Palestinian government. "From my standpoint, it does not look like Hamas intends to give up its ideology regarding Israel's destruction, and it does not intend to recognise Israel," he said. Top Israeli officials have begun a three-day brainstorming session to form policies to deal with such eventualities. Officials from the prime minister's office, the foreign ministry and the defence ministry are expected to advocate cutting off vital tax and customs revenues to the PA as an initial step. Meanwhile, Israeli authorities released a Hamas MP from Nablus who was elected in last month's election. Ahmed Ali Ahmed, also known as Ahmed Hajj Ali, had been held in "administrative detention" for five months without being charged or going to trial. Despite being in prison, Mr Ahmed won the most number of votes of Nablus' six MPs, including five other Hamas members. A further 14 Palestinians elected in January are currently in Israeli prisons, including Marwan Barghouti, a leader of the Mahmoud Abbas' Fatah movement who was jailed for life for the murder of four Israelis and a Greek monk.